This paper is in two parts. It seeks to contextualise the myriad changes occurring to newspaper websites through consideration of a body of literature that explores the implications of the media disruption caused in part by the continual rise of digital media. The paper then reports on a study of six Australian newspaper websites, which were all analysed on the same day in July 2014. The study focused on several elements of each website, including their architecture, story form and content, as well as their business models and use of multimedia. This analysis seeks to assess how newspaper websites are adapting to change and how they are relating to both their own readers and to the printed versions of the same masthead. The Internet posed a double threat to newspapers. Firstly, it threatened sales as people began to use the Internet as an alternative source of news and information (even if often provided by the very newspapers that were under threat). Secondly, and perhaps more important, the Internet threatened to undermine the advertising revenue that was so vital to newspapers. Paul Starr (2009) pithily comments: ?Newspapers increasingly sold not just news to readers, but also readers to advertisers? (p3). Starr traces the Internet?s role in undermining the newspapers? traditional major revenue source to its dual ability to provide alternative means for advertisers to reach consumers, and for consumers to seek out product information. Online there is no necessary relationship between news and advertising, nor are newspapers the only source of news and information. As the Internet developed, this pincer movement began to bite. The Economist ran a leader for a section on the future of newspapers in 2006 under the headline ?Who killed the newspaper?? (The Economist 2006). This reported that employment in the US newspaper industry fell by 18 percent between 1990 and 2004, and that: ?The business of selling words to readers and selling readers to advertisers, which has sustained their role in society, is falling apart? (p9). While Australian newspaper publishers may have been slow to recognise the threat of the internet to their businesses, the evidence of declining printed circulation and advertising revenue is now clear. All major Australian newspaper titles recorded a significant fall in average daily print circulation in July to September 2013 on the same period in 2012. The Age, The Sydney Morning Herald, The Sun-Herald and The Daily Telegraph all recorded decreases greater than 15%. The smallest decrease was the weekday The Australian Financial Review at 6.07% (Knott 2013). In relation to print advertising, the story is just as dramatic. Franco Papendrea of the The News and Media Research Centre based at Canberra University estimates that print advertising revenue in Australia fell by 17.7% between 2011 and 2012 (Papendrea 2013). In 2008, newspaper advertising accounted for 30.1% of media advertising in Australia. This fell to just 21.6% by 2012 (Papendrea 2013). If there has been a shift away from printed newspapers towards use of the Internet to gather news and information in the last few years, there remains a ?So what?? question. In summary, there have been three key points put forward as to why substitution of the Internet for printed newspapers is a concern. The first is an argument which has similarities to those made about the demise of the public sphere. Some writers argue that print newspapers are forced by the need to maximise circulation or a commitment to representing multiple viewpoints to attempt to achieve some notion of balance among (at least mainstream) points of view (McChesney & Nichols 2010). Citizens, it is argued, are exposed through their newspaper reading to alternative viewpoints and disparate voices, whereas online they are more likely to visit websites that reflect their particular worldview (Sunstein 2007). This critique, sometimes referring to an echo chamber, is also used in reference to television and the demise of the mass audience (Jamieson & Cappella 2008). In response Yochai Benkler largely agrees with Starr?s analysis on the likely demise of printed newspapers, but goes on to disagree with his dire warnings (Benkler 2009). Benkler argues that one needs to be realistic about the limited nature of the press?s record on ?corruption-busting?. Further, through a variety of means, web-based news services will be able to provide a similar (imperfect) brake on corruption and abuse of power. These means include: existing offline providers strengthening their web presence and increasing the revenue they derive from these activities; the emergence of more small-scale commercial media able to set up due to much smaller start-up costs in an online environment; and the harnessing of social production, often of ideologically committed participants and the emergence of new independent models for not-for-profits that will undertake serious journalism. Many commentators, including Benkler (2011), have seen in the ?Wikileaks? episode a positive sign of the new era of online scrutiny of the rich and powerful. Bill Dutton, in his work on the potential for online networks to create a ?Fifth Estate? of networked social accountability forecast this possibility (Dutton 2007). He concludes that this Fifth Estate can be a check on the ?other? estates, including the press potentially increasing the diversity of voices and opinions that can be heard (Simons 2007). The remainder of this paper reports on a study of six Australian newspaper websites, which were all analysed on the same day in July 2014. The publications were the Australian Financial Review, the Herald Sun, the West Australian, the Age, the Australian and online-only Guardian Australia. The study focused on several elements of each website, including their architecture, story form and content, as well as their business models and use of multimedia. This analysis seeks to assess how newspaper websites are adapting to change and how they are relating to both their own readers and to the printed versions of the same masthead. The study focuses in greater depth on Melbourne's two daily newspapers, The Age and the Herald Sun, comparing and contrasting their content across both online and print platforms. By analysing two papers ? with both broadsheet and tabloid sensibilities ? we gain insights into the dynamic tensions at play in this evolving news presentation format. In doing so, we briefly review the history of these platforms, from early perceptions of them as rivals to their current coexistence. The timing of our review turned out to be significant in that July 17, 2014 was the last day for several weeks when news coverage was not dominated by the slow-developing stories of Israel's 2014 Gaza war and the political, military and diplomatic fallout from the downing of Malaysia Airlines Flight MH17 over Ukraine. Both events would have their inception several hours after our review window closed. In the first part of this paper we sought to establish that newspapers are in trouble. We provided a brief history of the process through which newspapers lost their dominance under competition from digital media. We also demonstrated that this poses risks, particularly to the process of gathering news and the funding of serious journalism. It also threatens to alter the news consumption habits of newspaper audiences. In this part of the paper we begin the discussion about how the new news environment is developing. We do this by comparing and contrasting printed and online newspapers. There is an emerging orthodoxy around the architecture of newspaper websites. Each of the sites we observed had organised its pages in coherent and ordered ways to prioritise the most important content and showcase its particular strengths and areas of interest. Their homepages combined a mixture of text and visual elements that created a sense of activity and vibrancy and enticed readers to engage with the material. The content was arranged so that readers could easily navigate their way to the stories they were most interested in and skip over other categories of information. The Financial Review?s website published its most important breaking story near the top of the homepage. In printed newspapers this prominent position is described as ?above the fold?. 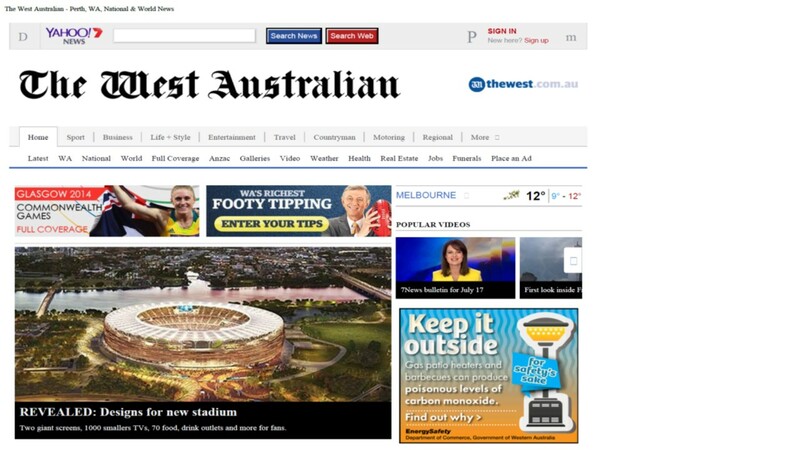 The West Australian had reserved this space on its homepage for a striking image of a proposed new stadium. In a printed newspaper this type of story is described as the ?splash? and, in much the same way as a front-page picture-based story in print would ?spill? to another news page, the website picture is accompanied by a link that takes the reader to the related text story. However, the decision to place a picture-based story so prominently above the fold relegated the day?s biggest breaking news to the lead item among the news tabs below the image. Figure 1 ? The Front page of the West Australian on the day of the study. 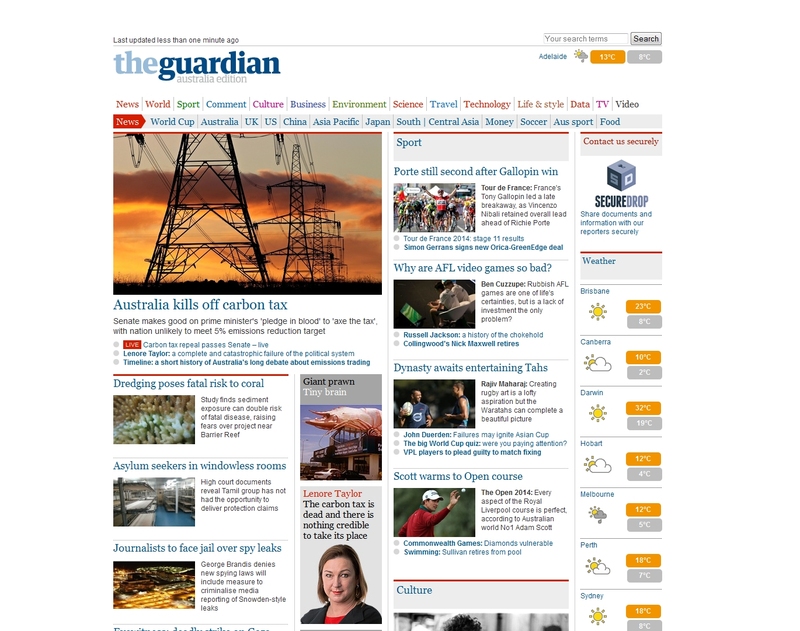 Guardian Australia, hereinafter referred to as the Guardian, made it clear that repeal of the carbon tax was its main story, giving it prime position and around twice the size of other major stories with an accompanying picture that would have taken up around a third of most people?s view of the front page. The Australian had the story as its lead but did not give it more prominence than other stories, although there was an accompanying opinion piece to the right of the story that had a larger accompanying graphic linked to a related video piece. It was notable that not one of the three leading articles run by the Age in its daily print edition was among the leading three posted on the newspaper's website. The websites generally placed a premium on rolling news content, with the most important breaking news taking up prime position. Many traditions of print newspaper design and reporting were reflected in the placement and treatment of major breaking stories. The stories followed the traditional inverted-pyramid form with the most important information contained in the first paragraph. For example, on the day of our study, the most important story concerned the abolition of the carbon tax in the Senate. This had occurred in the hour before we began looking at the websites. The first paragraph of the lead news story on the West Australian website declared: ?The Parliament has repealed the carbon tax after days of lengthy debate and negotiations.? The Guardian went with ?Australia?s carbon price has been repealed, leaving the nation with no legislated policy to achieve even the minimum 5 percent greenhouse emissions reduction target it has inscribed in international agreements.? The Australian made the story about Prime Minister Tony Abbott, with the front-page headline ?PM?s promise fulfilled as tax is axed?. The story then opened with quotes from Abbott. The Financial Review?s reportage was even more succinct. It said: ?After two years in operation, the carbon tax is dead.? Its story was labelled an ?update?. This hints at the versatility and durability of the inverted-pyramid news-writing model, which has been retained as the most common newspaper story form on new platforms, including newspaper apps, tablets and websites. The inverted pyramid was originally conceived as a means whereby printers could reduce the length of news stories while they were being laid out in hot metal presses, but without requiring the typesetter to read the inky text. If a story needed shortening, it would simply be cut from the bottom in the safe knowledge that the most important information was contained at the top of the story. The Internet has removed this constraint because news stories that run into sub-pages are not limited by space constraints. However, the inverted pyramid remains the news-writing model of choice because it allows for two important factors, both of which are vital for newspaper websites. The sites only include the first paragraph or two before the link takes the reader to the sub-page. The inverted-pyramid story form ensures the most important information is contained in the visible paragraphs and allows the reader to make an informed decision about reading on. It also allows for information in rolling updates to be added above the old text, with the new lead paragraphs containing the most important new information. The newspaper websites? homepages embody many of the other elements of printed newspaper front pages. The mastheads are prominent at the top of the pages and the main news stories are highly visible. There are compelling images across the homepage and they follow a reasonably predictable format from one day to the next. Interestingly, the homepages do not generally display the day?s date, underscoring that the websites operate in a permanent state of change. Stories, however, are date-stamped because this is an important element for readers seeking to fully understand the information within them. Equally interestingly, the advent of the ?eternal now?, as evidenced by the abolition of the fixed dateline, has led to the virtual disappearance of the word ?today? from Internet news coverage. In its place we see either the term ?this day? or the date itself. While this may irritate the reader in an online newspaper's hometown, it is presumably welcome to readers in the US, Europe or at an Internet cafe on the backpacker trail in Africa, because it removes a source of confusion for those in other time zones. The semantic shift has another implication: the end of today, yesterday and tomorrow not only shrink-wraps chronology itself but helps to establish a newspaper's credibility in the global media community. There is no reason why the West Australian, indeed aided by being situated on an East Asian meridian, shouldn?t market itself as a global newspaper. However, as we shall soon see, there is a tension ? born of its actual and perceived maximal readerships ? between a global perspective and a lingering (perhaps even justifiable) provincialism. By convention, the indexes of printed newspapers are generally located on either the left or right columns of the second page. However, newspaper websites elevate their indexes by using tabs across the top of their homepages. These tabs directly reflect the publications? various emphases. For example, on the day of the study, the Financial Review?s tabs were National; Opinion; World; Technology; Markets; Personal Finance; Lifestyle; and Interactives. The West Australian had two tiers of tabs with Sport; Business; Life + Style; Entertainment; Travel; Countryman; Motoring; Regional and More on the top row, and, somewhat confusingly, a second tier of links called Latest; WA; National; World; Full Coverage; Anzac; Galleries; Video; Weather; Health; Real Estate; Jobs; Funerals; and Place an Ad. Like all newspapers in their choice of homepage-heading tabs, the Age signalled that it knew and looked after its own. Left to right, they could have been a mind map drawn by any middle-class professional: after the predictable News and Sport they read: Business; Politics; Comment; Tech; Entertainment; Life & Style; Travel; Cars; Property; Multimedia. The last in the list, Subscriptions, made a more direct plea to reader loyalty. The West Australian?s Regional tab steered readers to a site hosting several country papers owned by the same company. Each of those papers was, in turn, reached through a secondary suite of geographically designated tabs, rather than tabs bearing the names of the individual mastheads. For example, clicking on the Goldfields tab automatically took readers to the homepage of the subsidiary Kalgoorlie Miner newspaper. The West Australian?s website sought to capitalise on the material at its disposal. Although the regional tabs were essentially just links to affiliated newspapers, it seems that the site was designed to look as if it was providing state-wide coverage. So too, the website?s links to video content created a sense that the West Australian website was a multimedia news outlet. However, it soon became apparent that virtually all the video stories were cut-down segments of reports from news bulletins produced by the newspaper?s affiliate, the Seven network. The Australian also relied heavily on footage from Fox Sports and Fox News that News Corp partly owns. A number of stories were accompanied by studio-based pieces to camera from their leading journalists and at least one lead story had a video attached that was only tangentially related to the print story it accompanied. On the other hand the Guardian had no obvious Australian video content and only one of the news stories on its front page had accompanying video. This was, however, compelling video taken by a journalist recording an Israeli bomb strike that killed four children. More broadly in relation to video content, The Guardian has used its reach to develop regular series of video programming, including movie and television reviews. These longer-form videos (10 to 15 minutes long) are prefaced by a 30-second advertisement. By early afternoon on the day of our study, it was apparent that the websites bore little resemblance to the printed editions. The breaking news about abolition of the carbon tax, which ran on every website we studied, ensured that the websites? lead stories no longer matched the lead stories in the printed editions. In most cases the latter were reflected somewhere in the content on the website homepages, but not universally. On the day in question, the above-the-fold news story in the printed version of the West Australian was entitled ?$300b black hole? and reported details about Treasurer Joe Hockey?s attempts to find other cuts after elements of his Budget had been blocked in the Senate. This story did appear on the West Australian?s website homepage, but it had been relegated to the last news story. Meanwhile the splash story about the new stadium, which dominated the website homepage, appeared nowhere in that day?s printed version. A notional visitor to two websites during our review ?window? could easily have been left baffled by just how parlous the nation?s finances actually were, for with that ?$300b black hole? fresh in her mind our website visitor might have felt relieved when clicking on the Financial Review site to see the headline ?Hockey's budget hole heading to $41b?. Only on closer inspection might she have noticed that these two news items were not actually contradictory. The smaller projection related to the deficit forecast for the last quarter of the current financial year; the alarming news that the nation is ?facing a $300b black hole? is contained in the West Australian story's lead paragraph: only five paragraphs further down would the eagle-eyed site visitor discover that $300 billion is how much ?further in the red? the economy is expected to descend ?over the next decade?. It would appear that over in the West it is not only the miners, but a less than scrupulous media, that dig themselves into deeper holes than anyone else's. In The Australian?s print edition the two main stories were ?Rich will bear load of petrol excise? and ?Returned radicalised jihadis ?a significant risk? ? ; on the website the former was still the most prominent article after the carbon tax repeal but the latter article had slipped down below the second banner ad to a position that was not visible without scrolling down. The lead story in the Financial Review, concerning a financial inquiry conducted by ANZ chief executive David Murray, was not on the website homepage at the time of our study. It was accessible via the Financial Services tab, but readers searching for it would have been disappointed to discover that it was blocked to non-subscribers. It appeared that access to approximately half the stories on the site was conditional on payment of a subscription. Were it a matter of one or two articles being replaced by a developing story, that might be explicable by reference to normal story churn, but this was not a particularly fast-moving news day, which leads us to conclude that either the perceptions of editors as to ?what is news? under the printed masthead and the electronic masthead are drastically divergent, or that the same decision-makers are consciously setting out to attract different audiences to their separate platforms. The banner headlines to the lead stories carried on that day's front page of the Age were, in descending order of importance, ?Tamils on high seas?, ?Napthine pressing Transurban for M1 toll revenue? and ?Les Mis?rables original manuscript coming to Melbourne?. Online, the Age?s three main headlines were: ?Carbon tax axed?, ?ATO's $200,000 tax bill, corrected to $8000, sparks $5.8m lawsuit? and ?Mexican ?house of horrors? raided: 596 living in captivity?. As if extra evidence were needed of distinctive news judgments being made across the platform divide, it is worth observing that in the print version of the Age an article about a man ?punching? a teacher took up nearly half the front page (even without a very prominent headline, a clear calculation by a news editor that this is a story worth ?splashing?). Yet the same story, under the same byline, rates only fifteenth out of twenty-six in terms of prominence in the online version. To understand why, we could reflect on how Internet news has evolved within the spectrum of news presentation formats over the past two decades. The Financial Review has trialled several business models and had to step back from early experiments with high paywalls when they were deemed too extensive and too expensive. The paper was an early adopter, by Australian standards, of limiting access to content and paid a price for seeking to exact income from readers. Its website now has a mixture of free and locked stories ? a model now common among newspaper websites and news blogsites. On the day of our study, several lead stories, including reports about Rupert Murdoch?s bid for Time Warner and Treasurer Hockey?s call for G20 nations to lift productivity, were blocked. When the reader clicked on the link, a banner appeared with the message: ?Already a subscriber? Please LOGIN HERE.? If not, the reader was assured he could ?STAY WITH THE STORY for less than $1.90 a day?. A SUBSCRIBE NOW tab took the reader to a site where he could sign up. The Australian operates a similar paywall that restricts access to ?premium? content. On the day of our study, the first three stories and related stories were all behind the paywall. Overall, some two- thirds of the content on the first page was inaccessible to non-subscribers. Figure 2 ?The Australian newspaper has active paywalls. On the day of the study six of the top seven stories were behind paywalls. The Herald Sun and Age have both erected paywalls that enable a certain number of visits for free. The Herald Sun enables five visits per week for unregistered users and ten for those who do register. 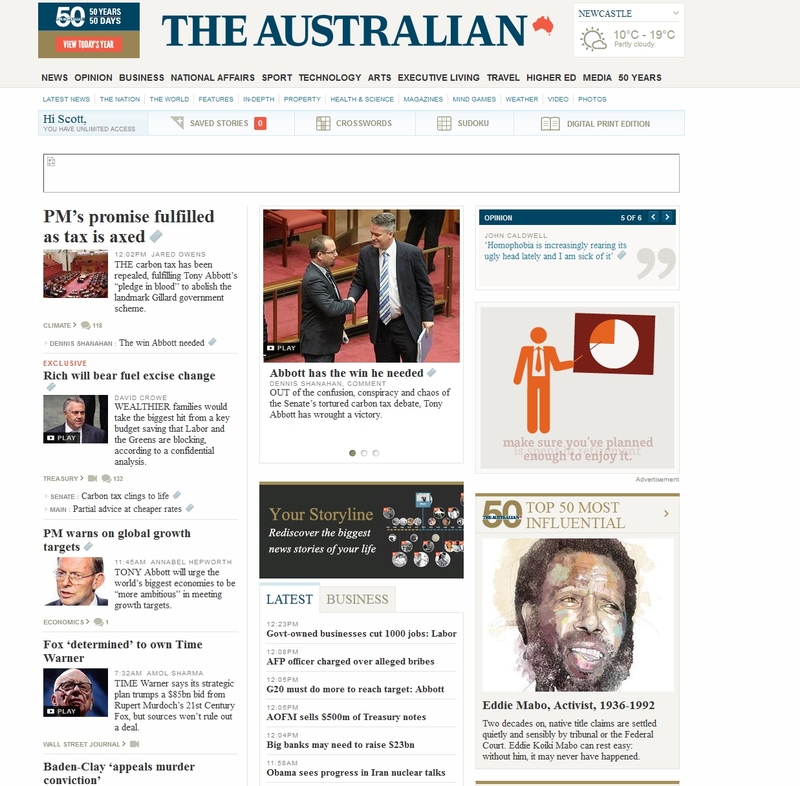 The Age allows non-subscribers thirty visits per month. The Guardian, in keeping with the policy of the organisation, does not use paywalls. Figure 3? The Guardian front page on the day of the study when all content was freely available. The process of choosing what goes behind a paywall and what remains free to readers is, we suspect, more a black art than a science. There are several competing factors to consider. All reporters want their stories read, so those who become editors have a natural tendency towards open publication. However, business imperatives are increasingly important and there is a greater acceptance by reporters of the need to operate commercially. Editors know that publications thrive on relevance, and that this depends on the impact stories have, which is in part based on the access readers and other media outlets have to those stories. So placing an important story behind paywalls can damage the publication, even though the significance of the story might drive large numbers of people to pay for the material. Against this, editors must consider ? for it is usually editors and not business managers who make these decisions ? whether the nature of the material might appeal to a section of the readership with a greater capacity or imperative to pay for it. In other words, will the material attract new and generous subscribers? Then there is the desire to reward subscribers, by providing content for them alone, in recognition of their investment in the publication. Most newspaper websites make these decisions around the clock, placing some content in the public realm and other content behind paywalls. Our study indicates that the criteria driving these decisions are complicated, subjective and inconsistent. The Financial Review did leave several stories in the public domain. Perhaps in making these choices, the publication considered the ubiquity of the material in question. If a similar story could be read somewhere else for free, there would be little point denying a reader access to it on the Financial Review site: in fact, it could drive readers away to other publications. This would explain why the breaking story about the abolition of the carbon tax and the aforementioned report about Treasurer Hockey?s black hole ? however large it turned out to be ? were offered free of charge. Newspaper websites must also maximise the capacity for their stories to ?get legs? and generate follow-up stories by other publications. This could explain why other stories on the day of our study were freely available, including a column by former federal Opposition Leader Mark Latham, which detailed the findings of a controversial Supreme Court decision. Other stories are offered freely for more obvious reasons. Tabs such as Personal Finance and Life + Style have a greater tendency to open platforms for advertising. It is clearly in the publication?s interest to drive as many readers as possible to these sites, especially as billing rates for online advertising are often indexed to page views by readers. In contrast, the West Australian appeared to have no paywalls. If content was promoted on the site it was fully accessible to the reader. The catch was that stories on the site tended to be older news, as if the website was regarded as the place where stories were put out to pasture when they had had their day in the printed version. Nevertheless the website was populated with a great deal of material ? sourced, as we have reported, from the West Australian itself as well as the media group?s affiliated regional papers and TV network. This provided a powerful platform for advertisers to promote products and services to readers. This is a variation of the long-tail business model, which recognises that publishers can generate considerable revenue by archiving and indexing their products and making them available long after the material has ceased to be current. The West Australian appears to have decided to create such a platform, without taking the step of constructing paywalls to force payment readers to pay for these stories. To protect the competitive advantage of the printed newspaper, it has opted to withhold the most current content from the website, effectively driving readers back to the printed edition. This section focuses in greater depth on Melbourne?s two daily newspapers, the Age and the Herald Sun, comparing and contrasting their content across both online and print platforms. By analysing two papers in the same geographic market ? one with both broadsheet and tabloid sensibilities ? we gain greater insights into the dynamic tensions at play in this evolving news presentation format. Pam Williams?s Killing Fairfax and Ben Hills?s more recent Stop the Presses! both describe at length how the challenge posed by the Internet to ?business as usual? was routinely under-estimated. These authors observed that over the past twenty years those working in the online sections of newspapers were viewed with contempt by their older and ?superior? print-based siblings, most of whom were determined to maintain their primacy in each publishing house. At the Herald Sun and the Age during this period, the authors witnessed how ?Internet staff? were regarded as a hybrid between ?kids barely out of school? who were playing at making newspapers and an interesting experiment that was but a sideshow to serious journalism. Today, largely because online is the main source of news for most Australians, older heads dare to hope it may end up saving the entire family of newspapers from ruin. Such hopes may yet prove justified, if a snapshot of viewer interest in the Melbourne newspapers? online product holds true in the months and years to come. In June 2014, the Herald Sun claimed more than 1.7 million unique visitors to its news website. For the same month, the Age told us that, according to Nielsen, its website received 2.027 million unique visitors. This is paradoxical, given that the Herald Sun has a print circulation of 340,000 per weekday, at least three times that of its rival, and suggests ? provided that the Age monetises its online presence at least as successfully as its hometown competitor ? that launching news into cyberspace is the first healthy response to the Internet evinced by Fairfax since the invention of the Web a quarter of a century ago. In the online world, as demonstrated by both newspapers, homepage editors prefer the ?flattened? landscape on which no one story soars above the others, with the lead indicated only by its placement at the head of a story list and the deployment of a slightly bigger headline than the one used for other items. In both newspapers? lead stories, we found that, as with the other news sites reviewed, the ?storytelling? approach to news reportage adheres steadfastly to the inverted-pyramid model. Significant space was also given to occasional columnist and former staff writer Julie Szego who eviscerated PM Abbott for channelling previously unnoticed Australian admiration for the efficiency of Imperial Japanese Army soldiers. Figure 4 ? 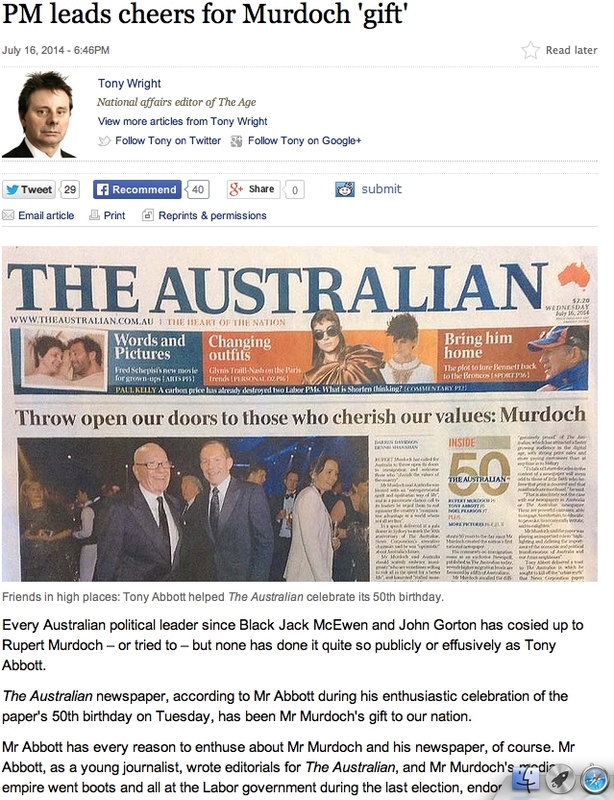 Age columnist Tony Wright in his on-line commentary piece featuring a print version of the opposition Australian newspaper. On July 17 the Herald Sun was making full use of its most (in)famous columnist, Andrew Bolt, whose thousand or so words were summarised for its online audience with a nine-word proposition: ?Carbon tax goes, snow falls in Melbourne: sceptics rejoice?. Rolling out ?big guns? from the worlds of media and politics could be seen as the Herald Sun's preferred approach to running a serious marketing campaign: on this day Andrew Bolt shared the computer and tablet screens with Jeff Kennett and Eddie McGuire, both practised controversialists. Yet, ironically, the evidence from our review period leads us to conclude that the Age runs a more opinionated news website than the Herald Sun. By coincidence, each site published 53 articles in the six hours under review. Of the Herald Sun?s 53, just over three-quarters (77 percent) were factual articles without any admixture of authorial opinion, whereas the Age ran only two factual articles for every opinion piece (64 percent to 34 percent). Fewer than one in five (19 percent) of Herald Sun online articles were totally or partly expressions of opinion as opposed to reports of fact. Whether by design or default, on this day the Herald Sun?s male columnists wrote on more ?serious? topics, their female counterparts on ?lighter? ones. Anyone uninterested in Bolt mirroring Wright of the Age with his own take on internecine media warfare (Bolt?s column ran under the headline ?Why is the ABC barracking for Hamas??) could turn for relief to Susie O'Brien?s ?think piece? on stay-at-home mums ? a serious topic handled in what might be considered a dumbed-down way ? or to Wendy Tuohy's observations on ?princesses and sluts?, a stream of consciousness so lightweight it seemed in danger of floating off the screen. Contrary to the opinion of some media commentators, the Herald Sun does not eschew investigative journalism altogether. On this day it continued to run an eight-day-old opinion piece ? news websites extending the life of its content products far beyond the use-by date of those in its print counterpart, which tends to be the same as the date of the paper itself. This opinion piece, written by Charlie Bezzina, was tagged ?The Investigator?, but there was no investigation involved in the piece, notwithstanding that. The Internet has disrupted the business model of traditional printed newspapers. This disruption has been obvious for at least five years and news organisations, to a greater or lesser degree, have been grappling with this for the best part of a decade. This study has identified that orthodoxies around the construction, architecture and form of websites have developed and there are common approaches to story treatment. There are new traditions around the use of links and video and even advertising which may give new life to old stories or bring new dimensions to storytelling. However, studying newspaper websites is not an illuminating experience for we do not get to glimpse a new paradigm that somehow amounts to a vision for the future prosperity of the news industry. Instead we see innovations and modifications that amount to little more than tinkering. We have seen the disruption: what we now need is another wave of innovation and creation. None of this adds up to a sustainable model, to the extent that there are as many commonalities across newspaper sites as there are differences between them. And these differences underscore the fact that newspaper websites are still experimenting with a broad spectrum of business models. As the editorial content is crucial to the business success of printed newspapers, so too the news content of newspaper websites is shaped by commercial considerations. How that content is archived, displayed, retrieved and accessed is largely determined by the business model being used. It is because the business model does not translate neatly from old ways of content delivery to new ones that advances in how the media harness the power of the Internet continue to be driven by experimentation rather than collected wisdom. Benkler, Y. 2009. 'A new era of corruption? ', The New Republic, 4 March, viewed 8 October 2012. Benkler, Y. 2011. ?Free irresponsible press: Wikileaks and the battle over the soul of the networked Fourth Estate?, Harvard Civil Rights-Civil Liberties Law Review, 46, 311-397. Dutton, W.H. 2007. 'Through the network (of networks) ? the Fifth Estate', Inaugural Lecture, Examination Schools University of Oxford, viewed 21 December 2010. Economist. 2006. 'Who killed the newspaper? ', Economist, vol. 380 no. 8492, 26 August, pp8-9. Jamieson, KH; Cappella, JN. 2008. Echo chamber: Rush Limbaugh and the conservative media Establishment, Oxford University Press, Oxford; New York. Jones, A. S. 2009. Losing the news: The future of the news that feeds democracy, Oxford University Press, Oxford; New York. Knott, M. 2013. ?Circulation results: Tele?s anti-Rudd campaign falls flat?, Crikey, 8 November, viewed 10 September 2014. McChesney, RW; Nichols, J. 2010. The death and life of American journalism: The media revolution that will begin the world again, Nation Books, Philadelphia, PA.
Pew Research Center for the People the Press. 1996. One in ten voters online for campaign '96 : news attracts most Internet users, Pew Research Center for the People & the Press, Washington, DC. Prior, M. 2007. Post-broadcast democracy: How media choice increases inequality in political involvement and polarizes elections, Cambridge University Press, New York. Simons, M. 2007. The content makers: Understanding the media in Australia, Penguin Books, Melbourne. Starr, P. 2009. 'Goodbye to the age of newspapers (hello to a new era of corruption)', The New Republic, March 4, 2009, http://www.tnr.com/article/goodbye-the-age-newspapers-hello-new-era-corruption. Sunstein, C.R. 2007. Republic.com 2.0, Princeton University Press, Princeton.